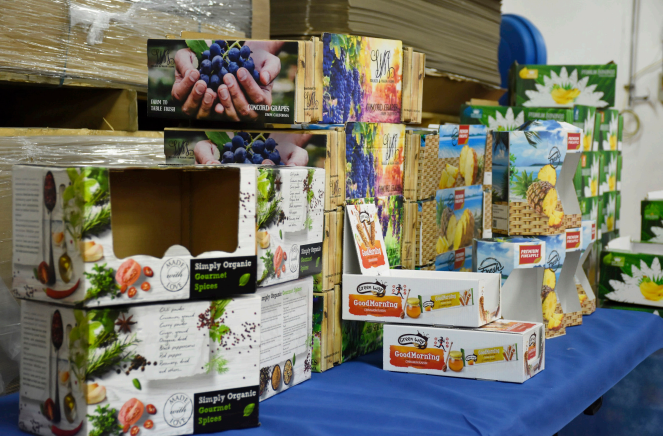 Wide format printing is not typically associated with packaging, but there are a growing number of devices that are suitable for some short run packaging applications. Packaging is generally seen as a long-run print application, with typical print runs of thousands or even millions of metres. Short run packaging is suitable for testing or prototyping packaging to be produced in longer runs. It also works for creating specific marketing campaigns, or for certain very short run luxury items and to personalise the packaging as an alternative to customising the actual product itself. Wide format service providers are in a very good position to handle this kind of short run printing and converting work for designers and retailers. Packaging includes several different applications and most wide format service providers should have the equipment necessary for at least one of these, if not more. Perhaps the most obvious packaging application is in boxes. To some extent any flatbed printer that’s designed for high volume work should be able to handle packaging as well, providing it can take large enough sheet sizes and can print to the required media. In addition, there’s a growing number of printers targeting the emerging market for digital printing on corrugated boards. This fits the current demand for minimal packaging that protects the goods within and is easily disposed of thanks to the use of sustainable raw materials. Caption: This monster device was introduced at drupa 2016 and EFI has installed several Nozomis in Europe and the USA. The EFI Nozomi C18000, now installed at several sites, is intended for corrugated, packaging and merchandise display printing. This single-pass LED printer prints up to 75 linear meters per minute on substrates up to 1.8 meters wide. It is ideal for on demand work that needs to be delivered very quickly and for prototyping. HP has developed several printers specifically for this market. The PageWide T1100 inkjet web press prints corrugated liners across a 280 cm width and is positioned for both short and long runs. The HP Scitex 15500 is a six-colour printer derived from the HP Scitex 11000 standard flatbed. The 15500 offers automated stack to stack, hands-free operations and a media handling system – the corrugated grip – that allows it to print to warped boards. There’s also a Scitex 17000, basically the same machine, but with eight channels using two sets of CMYK allowing it to be nearly twice as fast. The main competition to the HP Scitex devices comes from Inca Digital’s Onset X-series of fast flatbeds. These take boards up to 3.2 x 1.6m and 50mm thick. The fastest X3 can be configured with three sets of CMYK and can produce 900 sqm/ hr or 180 beds/hr. There are several options in terms of colours including white as well as an orange that can extend the colour gamut for reds and oranges and is useful for skin tones and some spot colours and is particularly aimed at packaging applications. There are both semi and fully automatic loading and unloading options. Caption: HP’s PageWide C500 for waterbased packaging printing is now in alpha testing at Carmen Frenkel in Israel. HP expects five more installations in the next few months. But the printing system is only part of the story. Wild format projects only come into being once they are finished, and this of course involves cutting the printed media to shape. Wide format digital printers rely on a number of different brands of cutting tables and any of these should be suitable for packaging applications assuming that your print service provider has the right tooling for the media you want to use. However, it’s worth noting that Esko offers the Kongsberg X Starter table, which can be configured for either signage or packaging. The packaging version is mainly designed for packaging mock-ups and very short runs so it is handy for short run wild format projects. It’s fitted with a FlexiHead that’s suitable for cutting materials such as folding carton and vinyl. Esko also has several software tools aimed at both brands and printers to help manage the production process. WebCentre, for example, is designed specifically for managing packaging workflows, including job specification and approval cycles. Esko has also developed PackEdge, a packaging preproduction editor while many wide format companies use Esko’s Automation engine workflow, which includes 3D design tools that are useful for planning structural print jobs, such as boxes and other packaging items, complete with folds and glue tabs. Labelling is another important application that wild format projects can use to embellish both the printed package and the product itself. Labels are best printed on printers with special colours such as white, which are useful for some effects that make the label stand out. For instance you can add textures using clear ink and gold or silver for producing metallic tints. Fujifilm, for example, has developed the Acuity 1600 LED, a 1.6m wide roll-fed wide format printer that uses UV inks with LED curing. It’s capable of two-layer printing (white + clear) and three-layer printing (colour + white + clear). It also helps if the printing system can be matched with a cutting solution capable of cutting through the vinyl around the printed label but not the backing sheet, so that it can be easily peeled away. In theory any type of cutter can do this but a dedicated print and cut machine is a good place to start. They’re relatively inexpensive and take up very little floor space. Roland sells several eco solvent printer cutters, such as the TrueVis VG, an 8-colour machine available in both 1625mm and 1371mm widths. Roland sells the VersaUV LEC, which prints CMYK plus white and clear. It can cut at up to 600 mm/ second and produce up to 500g of pressure. Mimaki has developed the UCJV300, a UV LED printer with integrated cutting that can lay down up to four layers. It can take up to seven colours including white. Mimaki also sells an older solvent model with integrated printing and cutting, the CJV300. It boasts a number of colour options including orange and white as well as silver that can be used to create metallic tints. The alternative for print service providers is to buy a separate cutter, which gives them the freedom to choose whatever printer they want. This is probably a better choice for large volumes as the printing and cutting can be done independently. HP also developed a print and cut solution, by bundling cutting plotters with its rollfed Latex printers. There are three options ranging from the entry level 54ins Latex 115 up to the 64ins Latex 335 printers. The workflow is Sai’s Flexi Print and Cut, which puts a code on the print so that the cutter knows where to work from. So, in conclusion there are lots of options for small manufacturing companies, retailers and other businesses wanting to produce short run digitally printed packaging. The quality of graphics that a wide format digital printer can produce, makes this technology an obvious choice.